Andhra University, Visakhapatnam applications for admissions into 6-Year Integrated (B.Tech. + M.Tech.) 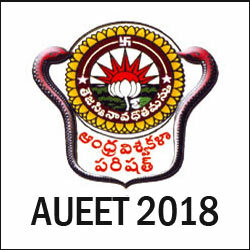 Dual Degree Programmes in CSSE, Computer Science & Networking, Civil, Mechanical, EEE, ECE, Chemical, Instrumentation Technology (with exit option after 4 years) through AUEET. Eligible Candidates may submit their applications through Online mode only. Application Registration and Processing Fee of Rs.1200/- (Rs.1000/- for SC/ST/PHC) may be paid through Bank hallan/Payment Gateway(credit/debit card). The dates for exam are yet to be out. Given above are the dates of last year's exam for reference purpose only. The dates will be updated for the upcoming exam soon after the schedule is out. The university shall not be responsible for either non-receipt or delayed receipt of communications in this regard. servations claimed in the application for verification. AUEET Rank card & Hall Ticket. Valid latest income certificate issued by M.R.O./ Thasildar if fee concession is claimed (the validity of income certificate is for one year from the date of issue). Candidates opting for admission under NCC/Sports/CAP/PH quota shall produce relevant original certificate, in addition to the above. Discharge certificate and service certificate of the parent incase of a child of armed person. the candidate are bad. If the University finds the antecedents of the candidates are bad subsequent to the appearance of AUEET, his/her rank can be cancelled and the candidate can be denied admission into any program under AUEET or admission can be cancelled even if admission is given. All the admissions are purely provisional and the university concerned reserves the right to cancel the admission at any stage. Cancellation of seats : Cancellation of seats will be made with 90% refund of total fee prescribed before completion of first phase and 80% refund before completion of second phase counseling and with no fee refund after second phase of counseling.